AUD 9,898 Excl. Duties / Taxes. This Oval diamond is 1.03 carat in weight, and comes with Excellent polish and Very Good symmetry, as verified from an independent gemological laboratory. The diamond is graded F in colour, and has a clarity grade of IF. The diamond's GIA grading report number is 6225285449, which will detail further its specifications and measurements, and will also come with the purchase of the stone. This Oval diamond is 0.36 carat in weight, and comes with Very Good polish and Very Good symmetry, as verified from an independent gemological laboratory. The diamond is graded H in colour, and has a clarity grade of VVS1. The diamond's GIA grading report number is 2314209278, which will detail further its specifications and measurements, and will also come with the purchase of the stone. AUD 3,954 Excl. Duties / Taxes. 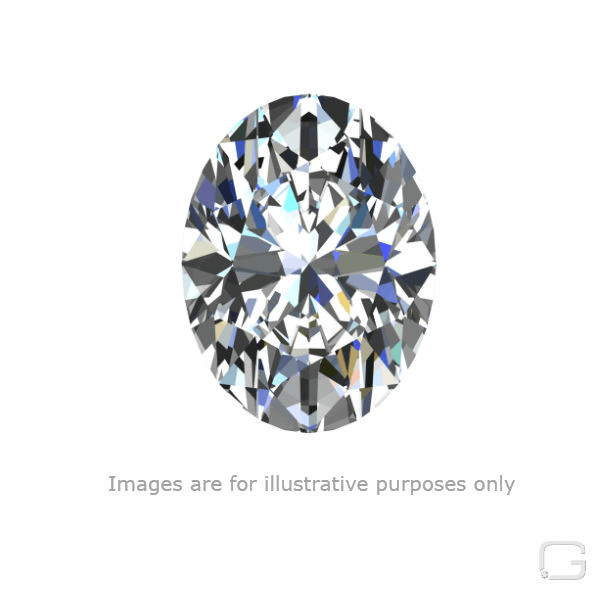 This Oval diamond is 0.69 carat in weight, and comes with Good polish and Good symmetry, as verified from an independent gemological laboratory. The diamond is graded D in colour, and has a clarity grade of VS1. The diamond's GIA grading report number is 2155733453, which will detail further its specifications and measurements, and will also come with the purchase of the stone. AUD 8,790 Excl. Duties / Taxes. This Oval diamond is 1.29 carat in weight, and comes with Excellent polish and Very Good symmetry, as verified from an independent gemological laboratory. The diamond is graded G in colour, and has a clarity grade of SI2. The diamond's GIA grading report number is 1295764045, which will detail further its specifications and measurements, and will also come with the purchase of the stone. This Oval diamond is 1.49 carat in weight, and comes with Very Good polish and Good symmetry, as verified from an independent gemological laboratory. The diamond is graded S in colour, and has a clarity grade of VS1. The diamond's GIA grading report number is 2193921591, which will detail further its specifications and measurements, and will also come with the purchase of the stone. AUD 4,669 Excl. Duties / Taxes. This Oval diamond is 1.01 carat in weight, and comes with Very Good polish and Very Good symmetry, as verified from an independent gemological laboratory. The diamond is graded G in colour, and has a clarity grade of SI2. The diamond's GIA grading report number is 6322150497, which will detail further its specifications and measurements, and will also come with the purchase of the stone. AUD 6,386 Excl. Duties / Taxes. This Oval diamond is 1.02 carat in weight, and comes with Excellent polish and Very Good symmetry, as verified from an independent gemological laboratory. The diamond is graded E in colour, and has a clarity grade of SI2. The diamond's GIA grading report number is 6197289526, which will detail further its specifications and measurements, and will also come with the purchase of the stone. AUD 4,388 Excl. Duties / Taxes. This Oval diamond is 0.9 carat in weight, and comes with Excellent polish and Very Good symmetry, as verified from an independent gemological laboratory. The diamond is graded F in colour, and has a clarity grade of SI2. The diamond's GIA grading report number is 2183021598, which will detail further its specifications and measurements, and will also come with the purchase of the stone. AUD 4,756 Excl. Duties / Taxes. This Oval diamond is 0.91 carat in weight, and comes with Very Good polish and Good symmetry, as verified from an independent gemological laboratory. The diamond is graded I in colour, and has a clarity grade of SI2. The diamond's GIA grading report number is 1176734039, which will detail further its specifications and measurements, and will also come with the purchase of the stone. This Oval diamond is 0.7 carat in weight, and comes with Excellent polish and Very Good symmetry, as verified from an independent gemological laboratory. The diamond is graded E in colour, and has a clarity grade of VS2. The diamond's GIA grading report number is 6203111671, which will detail further its specifications and measurements, and will also come with the purchase of the stone. AUD 5,397 Excl. Duties / Taxes. This Oval diamond is 1.01 carat in weight, and comes with Excellent polish and Very Good symmetry, as verified from an independent gemological laboratory. The diamond is graded H in colour, and has a clarity grade of SI2. The diamond's GIA grading report number is 5323268712, which will detail further its specifications and measurements, and will also come with the purchase of the stone. AUD 1,049 Excl. Duties / Taxes. This Oval diamond is 0.3 carat in weight, and comes with Very Good polish and Very Good symmetry, as verified from an independent gemological laboratory. The diamond is graded E in colour, and has a clarity grade of VS2. The diamond's GIA grading report number is 2316747372, which will detail further its specifications and measurements, and will also come with the purchase of the stone. This Oval diamond is 0.31 carat in weight, and comes with Very Good polish and Very Good symmetry, as verified from an independent gemological laboratory. The diamond is graded F in colour, and has a clarity grade of VVS1. The diamond's GIA grading report number is 6311353097, which will detail further its specifications and measurements, and will also come with the purchase of the stone. AUD 1,613 Excl. Duties / Taxes. This Oval diamond is 0.44 carat in weight, and comes with Excellent polish and Very Good symmetry, as verified from an independent gemological laboratory. The diamond is graded E in colour, and has a clarity grade of VS1. The diamond's GIA grading report number is 1319719701, which will detail further its specifications and measurements, and will also come with the purchase of the stone. AUD 8,981 Excl. Duties / Taxes. This Oval diamond is 1.03 carat in weight, and comes with Very Good polish and Very Good symmetry, as verified from an independent gemological laboratory. The diamond is graded D in colour, and has a clarity grade of VS2. The diamond's GIA grading report number is 2254369618, which will detail further its specifications and measurements, and will also come with the purchase of the stone. This Oval diamond is 1 carat in weight, and comes with Excellent polish and Very Good symmetry, as verified from an independent gemological laboratory. The diamond is graded F in colour, and has a clarity grade of VS2. The diamond's GIA grading report number is 2161617026, which will detail further its specifications and measurements, and will also come with the purchase of the stone. This Oval diamond is 0.62 carat in weight, and comes with Excellent polish and Very Good symmetry, as verified from an independent gemological laboratory. The diamond is graded F in colour, and has a clarity grade of VVS1. The diamond's GIA grading report number is 2317974496, which will detail further its specifications and measurements, and will also come with the purchase of the stone.